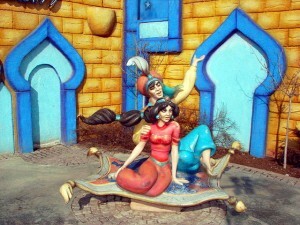 This is the opening scene from Aladdin, the introduction by the peddler to the story of the magic lamp. You can watch this scene in the video. The text for the dialogue is below. It’s barbaric, but hey–it’s home! Out there on the dunes. Ah, Salaam and good evening to you worthy friend. side of the river Jordan, on sale today, come on down! that counts. (Another pan, this one slower to left. lamp! It once changed the course of a young man’s life.